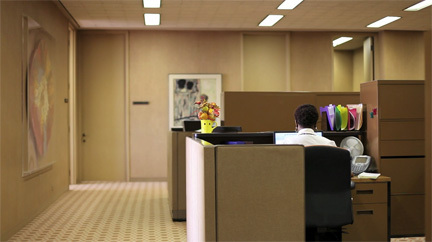 David Hartt’s 2011 photographic series and video, Stray Light (2011), explore the interior of the Johnson Publishing Company Headquarters, where every corner hints at this site as an evolving expression of Black culture and modern aesthetics. Designed by John Moutoussamy in 1971, the headquarters are lauded as the first downtown Chicago building designed by an African-American architect. 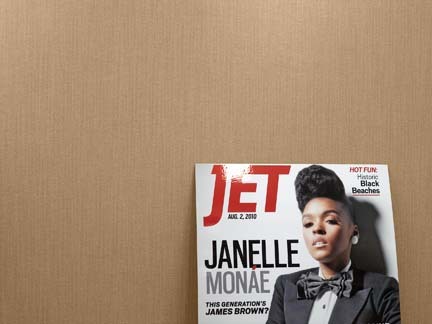 Moutoussamy collaborated with interior designer Arthur Elrod to make an environment reflective of the progressive vision of company founders, John H. Johnson and Eunice Johnson, who became national taste-makers with their popular magazines, Jet and Ebony. However cutting-edge these office spaces were in the seventies, Stray Light presents them as cultural artifacts. Golden and day-glow rooms, geometric patterned floors, and African-inspired sculptures render otherwise unremarkable cubicles exotic. As later additions, these industrial-looking cubicles evidence the merger between Elrod’s initial design and more recent styles. Hartt portrays this intermingling of the old and the new as a kind of spectacle. The video’s jazz-inspired soundtrack enlivens inanimate characters as the tempo slows with the rustling of bead curtains and later quickens when the kitchen’s psychedelic wallpaper appears. By casting the décor as theatrical and anthropological, Hartt’s footage evokes ways in which manmade structures resist and respond to changing times. Hartt often frames his lengthy shots behind obstacles, conveying the perspective of a prowler, and encouraging viewers to picture themselves peering over file-cabinets and potted plants along with the camera. This approach to navigating the headquarters emphasizes a gap between the Johnson Company community and Hartt’s outsider stance. As noted by many critics, the video’s title also insinuates that the artist’s presence is intrusive, like a “stray light” that unexpectedly enters a controlled environment. As such, the subjects in this environment do not make eye contact with the camera; the employees seem absorbed in work and at home in their eccentric settings. The video’s removed point of view calls to mind filmmaker Jacque Tati, whom Hartt admires for the way he used “qualities of architecture and geography as narrative devices.” Likewise, in Stray Light, the built-environment and its materials assume leading roles. Although a famous model of black leadership, the Johnson Publishing Company could not avoid the effects of a waning publishing industry. Only months after Hartt recorded its headquarters, the company sold its 820 Michigan Avenue building to Columbia College. In retrospect, Hartt’s documentation of these headquarters comes across as a tribute to the Johnsons’ vision as well as an inquiry into the future of their product and ideology. David Hartt was born in Montreal, Canada in 1967. 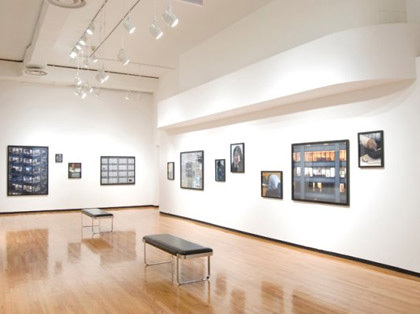 He completed a BFA from The University of Otta in Ontario, Canada (1991) and an MFA from the School of The Art Institute of Chicago (1994), where he now works as Instructor of Photography. He is the recipient of the Louis Comfort Tiffany artist-support program grant (2012). Hartt’s work has been in exhibitions at the Museum of Contemporary Art, Chicago; the Howard House, Seattle; Andrew Kreps Gallery, New York; and the L’Observatoire Galerie, Brussels.